Located in a city known for its rich history and heavy tourism, York test centre can be found on Murton Way. Small in size, the centre is next to The Stable Company, William Anelay and Varlink Limited. Though perhaps not as popular as York's tourist attractions, York test centre gets plenty of learner drivers visiting it each year. If you're one of the many learners heading here, why not get to know it better? Read on for directions, pass rates, test routes and much more about York. York test centre is a 15 minute drive from central York, not from from the University of York Campus East, near the bustling A64. To arrive there hassle-free, simply use the directions found here. Please note that York test centre does not provide parking facilities, so you'll have to make other arrangements. Driving test centres are carefully chosen to ensure they are located near a wide variety of road conditions. The York area has a wide mix of rural roads and urban areas, making it an ideal location for York test centre. With local A roads like the A64 and tricky rural lanes, York test centre will test candidates to their fullest ability. Want to know more about York in general? Follow the links below. Test routes are no longer published by the DVSA. While this does mean you can’t practice for an exact route, you can still get a rough idea of what to expect by watching videos of York test routes on YouTube or by downloading our sample York driving test routes. If you're learning with a local ADI they'll introduce you to the roads most likely to feature on your test, so that by the time your test takes place, you'll be familiar with most of the route. 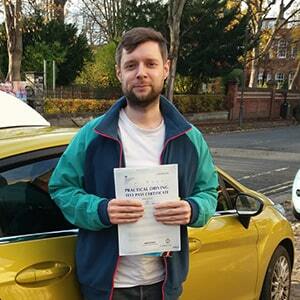 With pass rates higher than the national average, you should feel rather at ease with York test centre. If you’re not entirely confident with statistics, however, remember that it’s your driving ability that will get you through your practical. Try to work on your weakest areas with your instructor before you take your practical. What If I Can't Go To York? Learners in North Yorkshire can head over to a wide variety of practical test centres. If you can’t go to York, the nearest alternate centres are Knaresborough and Malton. You won’t have to wait long to get your results—you’ll get them as soon as you get back to York test centre. It doesn't matter what the verdict is, the examiner will walk you through any faults you made by using a feedback sheet. If you're successful, you'll receive your test pass certificate and send off for your shiny new licence. If you fail your practical, it’s as simple as learning from your mistakes and booking another test. PassMeFast can get you back behind the wheel in no time by fast-tracking your test. So if you're determined to ditch those L plates, give us a call on 0333 123 4949, or contact us via our website. If you’ve ever taken traditional driving lessons, you might have found that you spend most of your time refreshing your knowledge from the previous lesson. If this is an issue you’ve faced in the past, you might be better suited to an intensive or semi-intensive course courtesy of PassMeFast. Our grade A and B instructors are experienced and ready to help you learn how to be a confident driver. With PassMeFast you could be on the road in no time at all. Don’t wait—take a look at our course prices and book a course online or get in touch today on 0333 123 4949 to find out more about our courses. I passed with 0 faults! Cheers PassMeFast!